This is a free sample of our Iraq territorial control map. To access more Iraq control map updates like this one, sign up now for our conflict map subscription service! 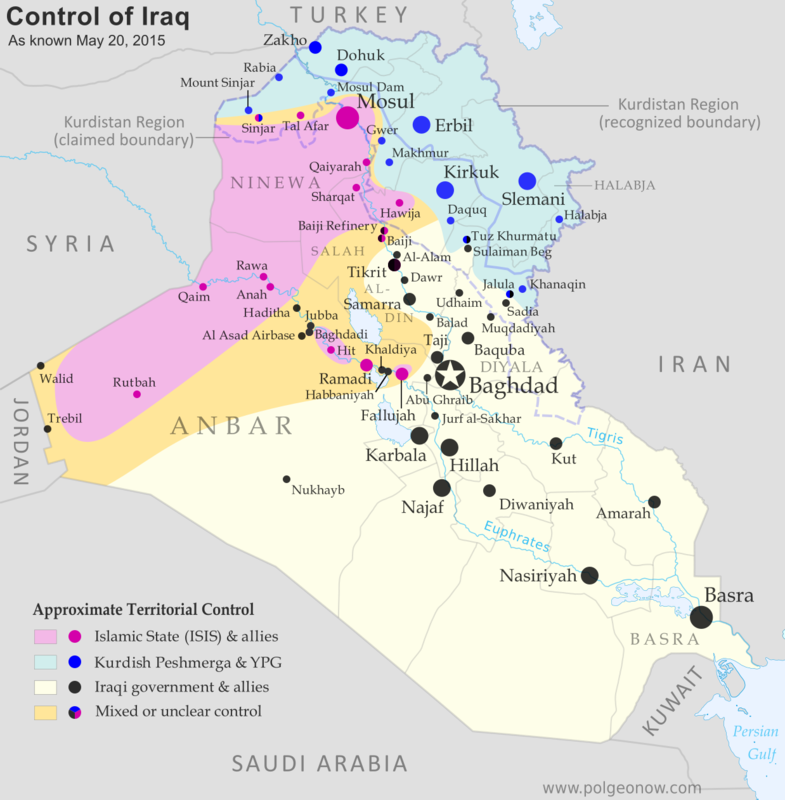 Since PolGeoNow published our February map of control in Iraq, two major cities have changed hands, in opposite directions. Tikrit, known as the home region of former leader Saddam Hussein, was the Islamic State's farthest-forward prize in its spectacular takeover of northern Iraq last June. A priority for Iraq's struggling Baghdad government, Tikrit was finally taken back this March and April in a major push by Shiite militias, led by Iran and ultimately supported by U.S.-Arab coalition airstrikes. Soon afterwards, however, the Islamic State struck back with its own campaign to secure control of Ramadi, the capital of western Iraq's sprawling Anbar province. Nearby Fallujah was the first Iraqi city taken over by Islamic State fighters almost a year and a half ago (free map), and parts of Ramadi have also been under the group's control ever since. However, focused efforts by the Iraqi security forces and allied fighters had kept much of the city under government control until just a few days ago, when Islamic State forces completely drove them out after a days-long battle. Though control in the Anbar countryside varies from town to town, there is now little doubt that the Islamic State controls a majority of the province's populated territory. 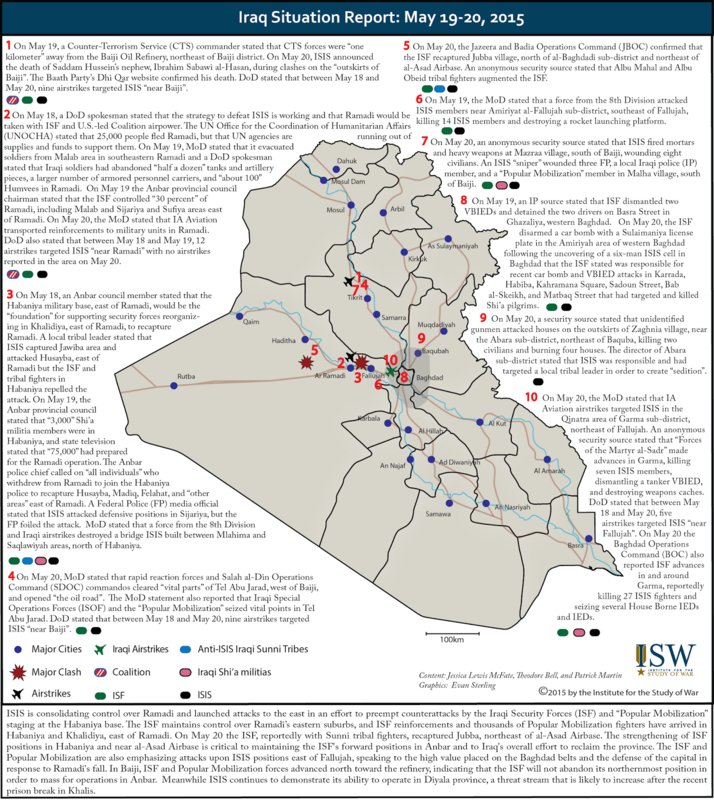 The following is an outline of major events since PolGeoNow's previous Iraq control map update in February. The Iraqi Defense Ministry claimed its forces had fully recaptured the town of Baghdadi, near Al Asad Airbase in Anbar province. An Iraqi government offensive began with the purpose of recapturing Tikrit, the third-largest Iraqi city under Islamic State control, with support from Iran and Shiite militias. Iraqi troops captured the police academy and hospital in Tikrit, as well as two oil fields in the surrounding Salah Al-Din province, according to a security official. Government forces assaulted the town of Dawr (Dur), south of Tikrit, and reportedly captured the town’s main street. Meanwhile, the U.S. military reported that Iraqi troops and allied militias recaptured the town of Baghdadi, several days after the Iraqi government had made the same claim. Government troops managed to capture the center of Dawr, but Islamic State fighters were still holding positions in the western part of town. The previous day, government forces had also captured a small town on the outskirts of Tikrit. Kurdish forces secured several villages along a 30-kilometer front, and advanced at some points up to five kilometers, in an offensive against the Islamic State southwest of Kirkuk. Meanwhile, government troops captured the town of Al-Alam, just north of Tikrit, and parts of another town south of the city. Al-Alam was officially declared under control of security forces by the local mayor. Iraqi security forces managed to recapture 50-75 percent of Tikrit, one day after entering the city, but further progress was stalled due to heavy resistance and mounting casualties. For the first time, the United States began airstrikes on Islamic State positions in Tikrit in support of the battle to seize the city. The action reportedly came in response to a request from Iraqi Prime Minister Haider al-Abadi. Several Shiite pro-government militias, part of the Iran-backed ground campaign to recapture Tikrit, reportedly pulled out of the battle in protest of U.S. involvement. Iraqi security forces reached the center of Tikrit, and soon afterwards the Iraqi Prime Minister claimed that most of the city had been seized. However, U.S. officials expressed skepticism, and were of the opinion the battle was still not over. In addition, an Iraqi military official in Tikrit itself stated they had only taken about half of it and that fighting was still raging throughout the city. (click for subscriber article and map). The last pocket of Islamic State resistance in Tikrit was cleared, according to an Iraqi military officer. However, the next day a reporter from Rudaw, a Kurdish news service, said there were still around 500 IS fighters in the city’s Qadisiya district. Fighting was still continuing in Tikrit’s Qadisiya district. The Islamic State captured two areas on the northern outskirts of Ramadi, after punching through government lines with suicide bombers. Tikrit was declared free of Islamic State forces by the Iraqi government. Government forces launched a counter-attack in Ramadi's northern outskirts and, according to a police officer, recaptured around 40 percent of it, but were facing stiff resistance. The Islamic State captured several villages on the outskirts of Ramadi and seized parts of the Baiji oil refinery north of Tikrit. With the latest advance in the area of Ramadi, according to the deputy head of the Anbar Provincial Council, the Islamic State was possibly only hours away from taking control of the provincial capital, with security “collapsing rapidly in the city”. Coalition airstrikes halted the Islamic State advance in the Ramadi area, cutting its logistical resupply routes. Former Saddam Hussein aide Izzat Ibrahim al-Douri, who escaped the 2003 US invasion and had recently backed the Islamic State, was reportedly killed in a military operation east of Tikrit. The dissolved Baath party denied his death, while Al-Arabiya TV aired a picture allegedly showing his body, and a Shiite militia stated his remains were sent to Baghdad for DNA testing. Al-Douri was the last major figure from Saddam Hussein’s government still at large. Brig. Gen. Hassan Abbas Toufan, commander of the Iraqi 1st Division, was killed in a suicide bombing, involving a bulldozer packed with explosives, against his convoy north of Fallujah. The attack also killed three other officers, a colonel and two lieutenant colonels. The overall toll was later put at 13 soldiers dead. It was confirmed that 30 policemen had been killed and 100 wounded during the previous week in heavy fighting in the Ramadi area. More than 100,000 people were displaced by the clashes which left government forces in control of only 20 percent of the city. Islamic State fighters captured half of the Baiji oil refinery and cut supply lines for around 150 government soldiers stationed at the facility, after four days of siege. Islamic State forces controlled almost two thirds of the Baiji oil refinery and had advanced so far into the facility that the Iraqi Air Force was not in a position to strike them without damaging the complex. Heavy fighting near Sinjar, in Iraq's far northwest, left 45 Islamic State and 22 Kurdish Peshmerga fighters dead. Islamic State forces expanded their control of the Baiji refinery to 80 percent of the facility, after Iraqi forces had suffered steady losses in the previous days. A U.S. F-18 fighter jet supporting operations in Iraq and Syria crashed in the Persian Gulf, with both crewmembers rescued. According to the Iraq Defence Ministry, the second-in-command of the Islamic State, Abu Alaa al-Afari, was killed in a coalition air strike in Tal Afar near Mosul. However, the U.S. denied parts of the story and did not claim to have killed al-Afari. Islamic State fighters captured Ramadi’s government compound, which houses most of the municipal and provincial government offices. They then focused their attack on the Anbar Operation Command, the provincial military headquarters. Soon after, according to at least one report, the Islamic State had taken full control of Ramadi, with more than 60 police officers killed in the fighting. Islamic State fighters also captured the town of Jubba, near Al Asad Airbase northwest of Ramadi. Islamic State fighters reportedly retreated from the main government building in Ramadi, after airstrikes from the U.S.-led coalition. The Islamic State captured the last remaining military bases in Ramadi, including the Anbar Operation Command, after a desperate retreat by Iraqi government forces. This left Islamic State forces in control of the city, with Iraqi troops retreating to its outskirts. An estimated 500 civilians and security forces members had been killed since the start of the IS offensive three days earlier, according to one official. The Iraqi Prime Minister ordered his troops not to abandon Anbar province in the face of the Islamic State advance. Among those killed in the final push was Col. Muthana al-Jabri, the chief of the Malaab police station, which was hit by four near-simultaneous suicide-bombings that left 10 policemen dead and 15 wounded. Additionally, five soldiers were killed and 12 wounded when three suicide-bombers struck the gate of the Anbar Operation Command. Two dozen police officers were also missing. At the request of the Iraqi government, Shiite militias were assembling in Habbaniyah for an eventual counterattack on Islamic State positions in Ramadi. Islamic State forces launched an offensive to capture the town of Khaldiya, near the Habbaniyah military base, but managed to capture only a village in its outskirts, while the attack on Khaldiya itself was repelled. Iraqi troops and local militias reportedly recaptured Jubba, near Al Asad airbase in Anbar, from the Islamic State fighters that took it the previous week. Don't miss anything: check back for more Iraq map updates on PolGeoNow! 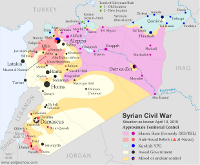 Categories: asia, conflict zones, divided countries, free conflict maps, iran, iraq, isis, kurdistan, middle east, original maps, rebel control, the "islamic state"